(1) DILLON KICKSTARTER. 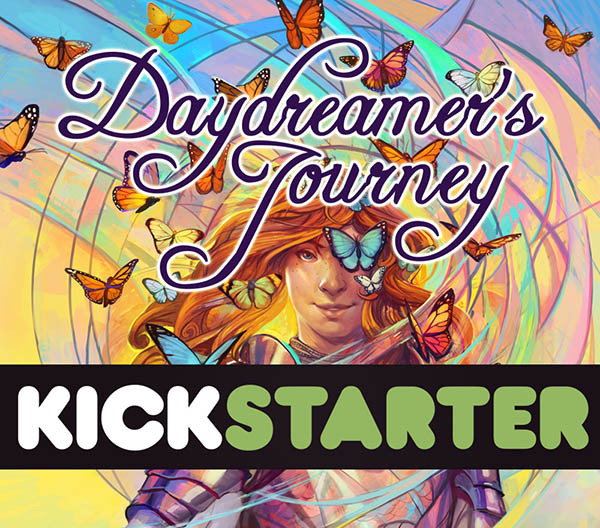 A Kickstarter to crowdfund “Daydreamer’s Journey, a new Art Book by Julie Dillon” was launched July 24. Dillon is one of the top artists in the field, a three-time Hugo Award winner (plus five Chesley Awards, three Locus Awards, and a British Fantasy Award). 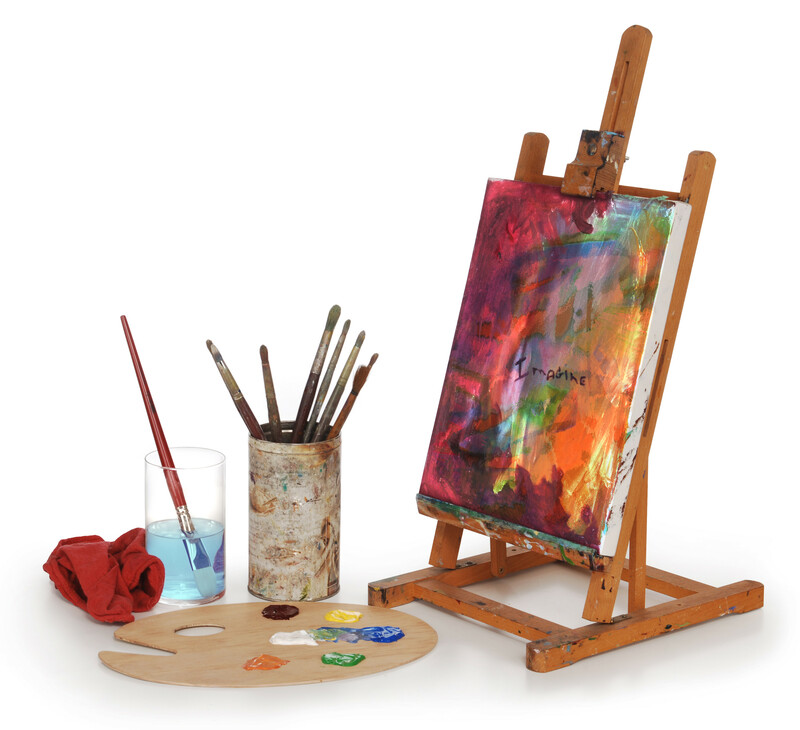 I absolutely love to draw and paint, and art has been a vital part of my life for as long as I can remember. Art can offer an escape as well as an invitation; a way to process one’s experience of the world, a way to offer a different perspective. It can illuminate and reveal the magic lurking just beneath the surface of the world, and that is what I’ve attempted to do throughout my career as an artist. I’ve put together an art book that will let me share with you more of my art and ideas than I ever have before…. 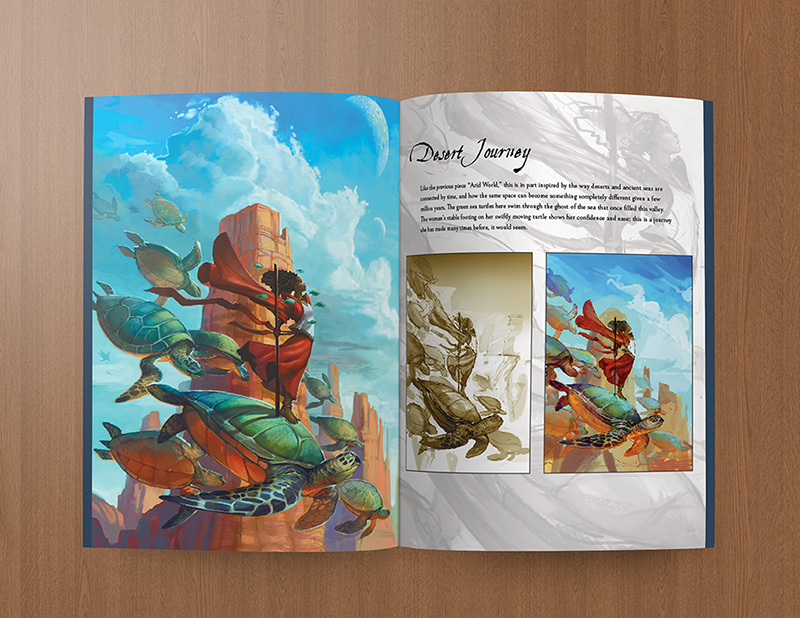 Daydreamer’s Journey will be a 200 page 8.5″ x 11″ hardcover book, on beautiful thick glossy paper. This book will contain personal work, freelance projects, sketches, studies, and illustration drafts, some of which either has never been posted online or that hasn’t been available online in over a decade. Also included will be my commentary and thoughts, as well as progress shots for most pieces so you can see part of my painting and brainstorming process. With 29 days to go, Dillon so far has raised $12,653 of her $18,500 goal. (2) #METOO AT COMIC-CON. SFGate evaluates the attention to antiharassment efforts at this year’s Comic-Con International in San Diego: “Comic-Con in the #MeToo Era: Progress Comes One Panel at a Time”. …Officially, Comic-Con was silent about #MeToo. When SDCC programming director Eddie Ibrahim gave his traditional kick off speech in Hall H on Thursday morning, notably absent was any mention of the convention’s harassment policies. That continued for all four days of the convention. …Comic-Con for its part has chosen not to update those anti-harassment policies, which state in part that “harassing or offensive behavior will not be tolerated,” and that “persons finding themselves in a situation where they feel their safety is at risk or who become aware of an attendee not in compliance with this policy” should seek out security or SDCC staff. Unofficially, fans and creators were frequently vocal in support of greater inclusion and representation, and in talking about harassment and abuse. And at a panel called “The Future Is Female,” “Bumblebee” and “Birds of Prey” screenwriter Christina Hodson got huge cheers and lots of knowing muttering when she celebrated the successes of the #MeToo era but noted that much work remains. “Nine months ago, no one gave a s—. Like, no one cares what happens. Now everything has shifted. So I think behavior on set, in writers’ rooms, that’s all going to shift. So I’m very happy about that,” she said. The American Library Association describes Elfquest as “one of the most important works in American fantasy”. Georgy Khoury and Alex Ross, in Comic Book Fever, call it one of the “first long-form sagas of the art form,” unique for its “confident and inspired storytelling.” Artist and historian Trina Robbins told me that Wendy’s strong women characters were responsible for getting countless young girls into comics. Elfquest was one of the books targeted as obscene material in the Comic Book Legal Defense Fund’s first case. Buzzfeed ranked it as the most life-changing graphic novel of all time. But now, some three decades-plus since we first “saw” Cyberpunk, what do we have now? Is there a unifying visual idea that we associate with modern (2000 and beyond) science fiction? I’ve noticed over the last decade or so that there are some recurring themes. Perhaps not exclusive to science fiction – in the same way that the Cyberpunk aesthetic wasn’t exclusive to science fiction (see: Black Rain) – but that I’ve seen recurring in genre work. I call it Hard Concrete. Like Cyberpunk and Atomic Age &Space Age design before it, Hard Concrete is linked to the realities of the times. If Cyberpunk was the visual embodiment of the corporation as mysterious behemoth, Hard Concrete parallels a world where corporations and governments have been exposed as brutal, uncaring and stripped of their shiny, mirror-glass facades. They may be no less controlling, violent or malevolent, they just no longer bother to hide it. (5) ORDER ME ANOTHER SCREWDRIVER. 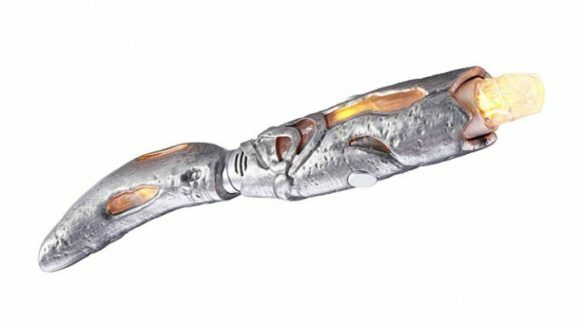 The Thirteenth Doctor has a collectible out already: “Jodie Whittaker Reveals the New Sonic Screwdriver Fan Collectible at San Diego Comic-Con”. Today in Hall H at San Diego Comic-Con, Jodie Whittaker revealed the new Sonic Screwdriver Fan Collectible, a replica of the one her character will use in the new series of Doctor Who, now available to pre-order. And thank you to the wonderful Shiree Collier for her excellent modeling and Gal Gadot for that pretty face. (7) ‘WARTS AND ALL. [Item by Mike Kennedy.] Those cunning Danes are at it again, dreaming up ways to take your money. LEGO has announced a new Hogwarts set (io9: “Lego’s New 6,020-Piece Hogwarts Castle Set Is Huge and Pricey”) priced at a “mere” $399.99. It’s built on their “microscale” standard, to use microfigs rather than the more familiar minifigs—presumably to keep the both the overall size and the price in check. …Lego is also bundling 27 microfigures with the set, including Dumbledore, Harry, Ron, Hermione, Draco, Snape, McGonagall, Remus, Umbridge, and even Lord Voldemort, as well as Aragog the spider, the Basilisk, a Hungarian Horntail dragon, and five dementors. Despite the smaller overall footprint of the set, Lego has still managed to stuff an incredible amount of detail into Hogwarts, including the castle’s Great Hall, the library, potions class, the Room of Requirement, the giant chess set, and the Chamber of Secrets, among other places for the microfigures to re-enact scenes from the books and movies. (8) KGB READINIGS. 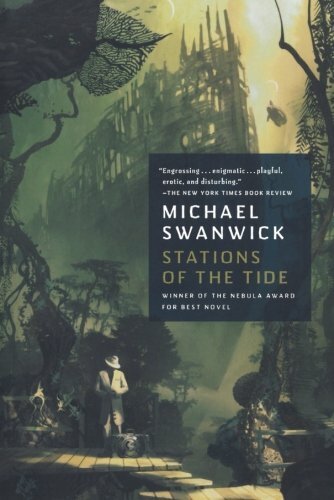 Fantastic Fiction at KGB reading series hosts Ellen Datlow and Matthew Kressel present Michael Swanwick and Jeffrey Ford on Wednesday, August 15, 7 p.m. at the KGB Bar. Jeffrey Ford is the author of the novels The Physiognomy, The Girl in the Glass, The Portrait of Mrs. Charbuque, The Shadow Year, and the four collections: The Empire of Ice Cream, The Drowned Life, Crackpot Palace, and A Natural History of Hell. 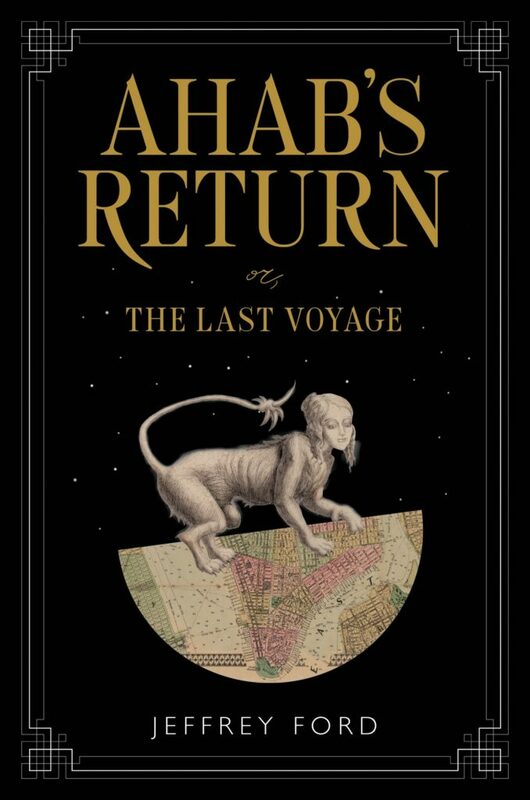 His most recent novel is Ahab’s Return: Or The Last Voyage published by HarperCollins. He has been the recipient of the Nebula Award, the World Fantasy Award, and the Edgar Award. He lives in Ohio and teaches writing part time at Ohio Wesleyan University. The KGB is at 85 East 4th Street (just off 2nd Ave, upstairs) New York, NY. Website: www.kgbfantasticfiction.org. Cheshire cat humor in The Argyle Sweater. (10) WORLDCON 76 BUSINESS MEETING AGENDA. More items have been added, so WSFS Secretary Linda Deneroff suggests you re-check the Business Meeting Agenda. (11) ONE IS THE ONLIEST NUMBER. James Davis Nicoll asks “What’s With Sci-Fi’s Fixation on Single-Gendered Planets?” at Tor.com. There are actually quite a few speculative fiction books set on single-gender planets (in which gender is mainly imagined in terms of a binary model) 1. Most of them are what-if books. As one might expect, they come up with different extrapolations…. …So how similar was the packaging? Well this is the cover of the very first Signet Double…. And this is the cover of the very first Ace Double…. Okay, so they don’t look that alike and the Ace artwork is decidedly pulpier in style. But then it would be, wouldn’t it? Don Wollheim wasn’t going to try and muscle in on Signet’s classier patch. No, Don Wollheim was going to do what he knew best and let’s not forget that Don’s editorial career had begun with Cosmic Stories and Stirring Science Stories, two of the pulpiest of the pulp magazines. Covers not withstanding it’s pretty clear to me that the Ace books borrowed a lot of layout detail from Signet. If you have any doubt about that compare the spine of Signet’s Knock On Any Door with the spine of a 1958 Ace Double featuring Eric Frank Russell I just happen to have laying about. Oh, Don Wollheim you clever scamp. Now you might be thinking that this is all very well but really, what did the Ace Doubles do other than borrow some layout details from Signet? The core feature, the two different novels in one volume, well that’s clearly unique to Ace, isn’t it? Now if you’ve been thinking anything like that then you are so very wrong. Consider the examples pictured below and their publication dates; Two Complete Detective Books (Winter 1939), Two Daring Love Novels (January 1948); and Two Complete Science-Adventure Books (Winter 1950). Three magazine titles that predated Ace Doubles by years (and the first two even left Kurt Enoch and his Signet Doubles in their dust). (13) THERE GOES THE NEIGHBORHOOD. At Tor.com, James Davis Nicoll complains that “Classic Sci-Fi Star Systems Keep Getting Ruined by Science”. Well, complains is probably overstating things…. 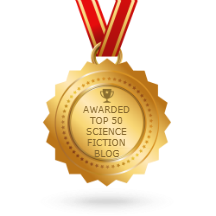 In fiction, Procyon is home to L. Sprague de Camp’s Osiris, Larry Niven’s We Made It, and Gordon R. Dickson’s Mara and Kultis, to name just a few planets. Regrettably, Procyon A should never ever have been tagged as “possesses potentially habitable worlds.” Two reasons: solar orbits and Procyon B’s DA classification. (14) THE LATE MR. ELLISON. Mark Evanier tells “A Harlan Ellison Story” at News From Me. Now with Harlan’s passing, the Internet is filled with remembrances and honors and cyber-mourning and tributes, and in lot of them you’ll see some version of the phrase, “He inspired me to become a writer.” Harlan did a lot of that. He inspired people in other ways, as well. He occasionally inspired someone to hate Harlan Ellison but we won’t go into that here. Here, I’m celebrating him for inspiring so many people in a good way. Like I said, he was a writer who made other writers proud to be writers. And all that is just an introduction to the story Evanier promised in the title…. From an analysis of the psychological impact of fairy tales to an illustrated biography of a well-known illustrator and a book about the landscape that inspired Anne of Green Gables, there’s plenty to inform and inspire adult readers of children’s books. (16) CALL GOES OUT. Manifold Press is relaunching and Managing Editor Farah Mendlesohn wants to spread the word. Please RT far and wide From today I am the new Managing Editor of @ManifoldPressUK Our new call for fiction is at https://t.co/6P0g6PcVhq Do you have queer historical fiction tucked away? 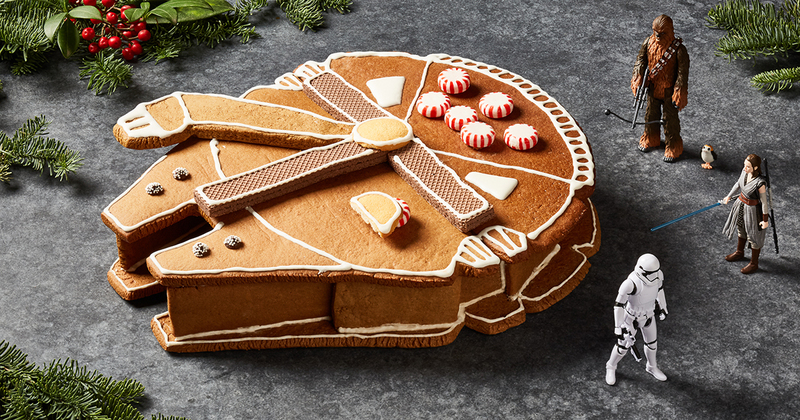 Now is the time to dig it out. I am looking for twelve varied titles for our 2019 list. As from today, we are delighted to announce that after a period of reorganisation, Manifold Press will relaunch on the 1st January 2019. Please note: we are revamping our web pages so none of the menu links work. That will change bit by bit over August. We’ll announce on the blog and on twitter and fb etc as we create new pages. At our AGM in July we bade a fond farewell to Julie Bozza who is heading back to Australia; Fiona stood down as Managing Editor after 9 years with the press. The new Board consists of Farah Mendlesohn (Managing Editor), Sandra Lindsey, Fiona Pickles and Aleksandr Voinov. We are actively recruiting others. We have opened a new call for submissions. (17) DO YOU GROWL WHEN YOU’RE PLEASED? The BBC story “The complicated truth about a cat’s purr” notes that cat research lags behind the study of dogs because dogs are more willing subjects…. Part of the mystery around the purr is that we often only notice cats purring “when we tickle them in places that they like to be tickled”, says Debevere. Yet they also purr when we’re not around, and the extent of that purring varies between individuals. “All cats are different, some never purr and some will purr constantly,” she says. She draws the comparison between her cat Luigi – a stray who followed someone in to their office and was subsequently taken to a shelter – and Archie, who “moved in from next door” and became part of the family. Luigi purrs little, and Archie a lot. (18) UH-OH. Sarah Kaplan and Joel Achenbach in the Washington Post report that the James Webb Space Telescope, which has already cost $7,6 billion, will have its launch delayed until 2021 because of screws that fell off of the sun shield during a test, leaving critics to argue that the telescope could be “too big to fail and too complicated to work.” “NASA’s next great space telescope is stuck on Earth after screwy errors”. The Webb’s problems have rattled many powerful constituencies. NASA is embarrassed and dismayed by the human errors that have snarled its biggest robotic science project, which was identified by the astronomy community back in 2000 as its top priority. (19) NOT THE SAME SHAPE. Judge dismisses The Shape of Water copyright suit – the BBC has the story. The plot of Oscar-winning fantasy film The Shape of Water was not copied from a 1969 play, a US judge has ruled. Judge Percy Anderson has dismissed a legal action that claimed Guillermo del Toro’s film copied the story of Let Me Hear You Whisper by Paul Zindel. The late playwright’s son sued del Toro, the Fox Searchlight studio and others in February, claiming the two works were “in many ways identical”. In his ruling, however, the judge said they only shared “a basic premise”. (20) THE STARS THEIR DESTINATION. Something people of the future will be running into: “Japanese firm to launch wedding plaques into space”. According to the Yomiuri Shimbun newspaper, the Warpspace start-up in the city of Tsukuba is working with Kibo, Japan’s orbital science module, to launch wedding plaques from the International Space Station. The company, which is largely staffed by faculty members from the University of Tsubuka, says that it will engrave couples’ names, messages, and other information on titanium plaques, measuring some 16 millimetres by eight millimetres. The plaques will then be loaded onto miniature cubic satellites, which can hold several hundred plaques, and be released into orbit. They will join the tens of thousands of satellites, man-made objects and space junk already orbiting the Earth. Batman is sick of the perpetually rainy and depressing DC Universe; he’d rather have a seat at the Avengers’ table.